Hon. 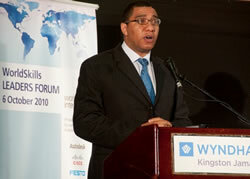 Andrew Holness - Minister of Education, Jamaica, delivers the keynote address. 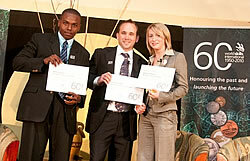 WorldSkills Youth Forum panelists: Omar Johnson (Jamaica), Andrew Arthur (Australia) and Katie Watson (United Kingdom). 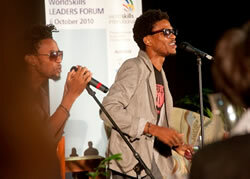 The WorldSkills Leaders Forum (WSLF) welcomed many passionate speakers to share their views on Technical Vocational Education and Training (TVET): Implications for Sustainable Development during the WSLF in Kingston, Jamaica on October 6, 2010. From the talented performers, the presenters, the keynote presentation and the panel discussions, one realises that several common themes connect everyone who is part of the global skills movement. Themes of transformation, innovation, the belief in youth and the celebration of excellence help guide all countries/regions that are Members of WorldSkills International. Regardless of where you reside in the world, the soul of the modern youth is present in all aspects of Technical Vocational Education and Training. People are our most important natural resource; the training and development of people is and will continue to be the key to a sustainable global workplace for years to come. Educators, policymakers, leaders of industry and government must work together to transform the image of vocational education. We must all re-examine the perception of these careers as ‘last chance’ options and switch to excellent and viable first choice career options for youth. No matter where you live, the commitment, the challenges and the needs are similar – engage youth, engage their communities and champion the Technical Vocational Education and Training cause. Tjerk Dusseldorp, the President of WorldSkills International summed up the experience of many of the youth of today who see the world as their workplace and who view skills as the new global currency. People today must be creative and productive both locally and globally and this will be accomplished as collaboration and innovation in educational training programs continues to take place in countries around the world. A question arose from the audience: ‘As an Individual, what can I do to aid this valuable work?’ To answer using words of Honorable Andrew Holness, the Minister of Education in Jamaica “knowledge determines what you can do, what you can do determines who you are.” We must all take responsibility to champion technical education around the world; we must all be knowledgeable and shine the spotlight on these careers. In the words of the Nomads, one of the bands who performed, we must continue to ‘improve on yesterday, to get what you desire, reach.’ This is what we will continue to do – reach for more knowledge and reach for the betterment of our most precious resource – our people around the world.